The sixth season of the American television medical drama Grey's Anatomy, commenced airing on the American Broadcasting Company in the United States on September 24, 2009, and concluded on May 20, 2010. The season was produced by ABC Studios, in association with Shondaland Production Company and The Mark Gordon Company; the showrunner being Shonda Rhimes. 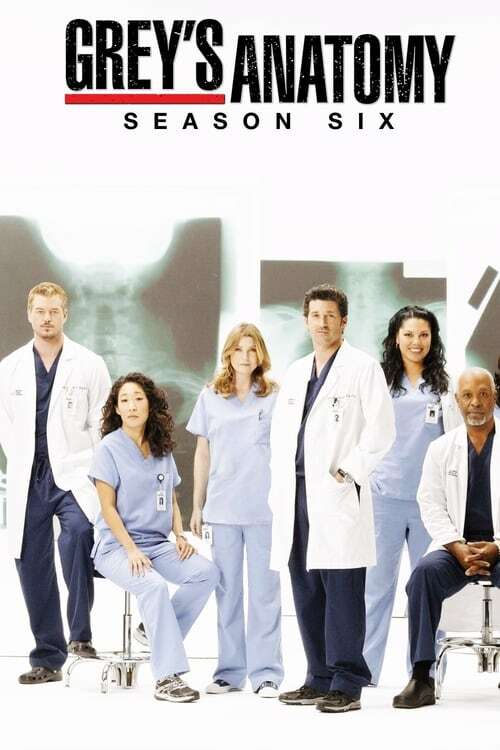 Actors Ellen Pompeo, Sandra Oh, Katherine Heigl, and Justin Chambers reprised their roles as surgical residents Meredith Grey, Cristina Yang, Izzie Stevens, and Alex Karev, respectively. Heigl was released from her contract in the middle of the season, while T.R. Knight did not appear as George O'Malley, because Knight was released from his contract at the conclusion of season five. Main cast members Patrick Dempsey, Chandra Wilson, James Pickens, Jr., Sara Ramirez, Eric Dane, Chyler Leigh, and Kevin McKidd also returned, while previous recurring star Jessica Capshaw was promoted to a series regular, and Kim Raver was given star billing after the commencement of the season. The season follows the story of surgical interns, residents and their competent mentors, as they experience the difficulties of the competitive careers they have chosen. It is set in the surgical wing of the fictional Seattle Grace Hospital, located in Seattle, Washington. A major storyline of the season is the characters adapting to change, as their beloved co-worker Stevens departed following the breakdown of her marriage, O'Malley died in the season premiere—following his being dragged by a bus, and new cardiothoracic surgeon Teddy Altman is given employment at the hospital. Further storylines include Shepherd being promoted to chief of surgery, Seattle Grace Hospital merging with the neighboring Mercy West —introducing several new doctors, and several physicians lives being placed into danger—when a grieving deceased patient's husband embarks on a shooting spree at the hospital, seeking revenge for his wife's death.